Igor creates a new vampire to roam the halls of Castle Duckula but he messes up and creates a vegetarian vampire, Count Duckula who would rather eat salad instead of blood and play some music. But Dr. Von Goosewing, the worlds greatest vampire hunter, is on his trail in A Minor Fowl-Up. 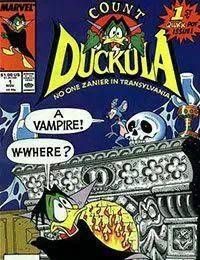 And then Count Duckula decides to try to become a movie star and travels to Hollywood to do so in Lights! Camera! Traction!